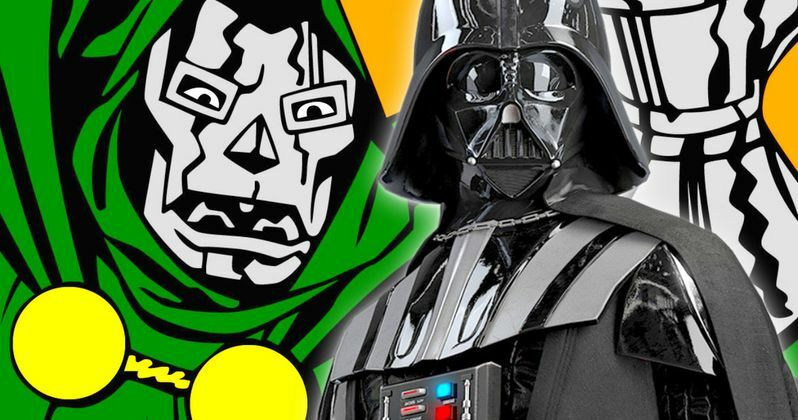 Was Darth Vader a Rip-Off of Jack Kirby's Doctor Doom? Today is a very special day for comic book fans. Or really, given the modern landscape, fans of pop culture in general. Today is Jack Kirby's 100th birthday. Sadly, we lost the legend in 1994, but his legacy and influence have lived on and continue to inspire creators across many forms to this day. In fact, one of the greatest villains in the history of cinema, Darth Vader, may have been heavily influenced by one of Jack Kirby's creations, Doctor Doom. Some might go so far as to say Star Wars ripped Kirby off. There is no single "smoking gun" piece of evidence for this, but the similarities between Darth Vader and Doctor Doom are hard to ignore. So, in honor of Jack Kirby on what would have been his 100th birthday, let's look at the evidence. Starting with Kirby's partner and Marvel Comics legend Stan Lee, the man who partnered with the artist to make some of pop culture's most recognizable creations, pointed out these similarities. As pointed out by Paste Magazine, Stan Lee had this to say in a collection of Fantastic Four reprints in 1979. "Hey, gang, have you seen Star Wars? Okay, okay, I realize that's like asking if you can spell your name. But anyway, remember the villain, Darth Vader?...you are about to meet one of our own Marvel villains, and I just suspect that you might notice the teensy-weensiest little resemblance! And, in case you're wondering, Dr. Doom came first, by about 15 years, give or take a micro-minute or two." Stan Lee may have a point here. Just looking at the two characters side-by-side, there are noticeable similarities. The flowing cape, the menacing presence, the size. But the similarities go beyond the surface. For one, both Doctor Doom and Darth Vader were horribly disfigured, which is why they both wear masks to hide their face, but also make them look more imposing. Also, Vader and Doom are both well versed in ancient teachings. Vader has the ways of The Force and Doom has practices of Tibetan Monks. George Lucas Star Wars villain definitely has some more than coincidental similarities to the famed Fantastic Four bad guy. The Fantastic Four is known as Marvel's first family and they were created by Stan Lee and Jack Kirby in 1961. Doctor Doom soon followed in 1962 in Fantastic Four #5. Like Darth Vader, he is generally considered to be one of the best villains of all-time, though he has never had his proper due on the big screen. As such, he is overshadowed quite substantially by Darth Vader and the monster that is the Star Wars franchise. There is no hard evidence that says George Lucas stole the design for Vader from Jack Kirby, but it is more than enough to raise an eyebrow. Regardless, they don't call him King Kirby for nothing. The man created Captain America, Black Panther and a whole host of incredible characters for Marvel and DC Comics during his lifetime. Not the least of which was Doctor Doom. And, even if we can't say for sure, he very well may have had a big part in influencing one of the greatest villains ever in any medium with Darth Vader from Star Wars. All hail the king.